I have recently been working on a number of sculptural hollow forms and open vessels - vases - mounted in unusual ways; some hanging some balancing, etc. 2. What direction do you see your work taking in the future? I hope to experiment more with textures, forms, and ways of presenting my work, at the same time introducing various other complementary materials. I also hope to increase the demonstrating and teaching side of my business. Most importantly, get a good extraction system and protect your lungs. I see this as the most important tool in my workshop. 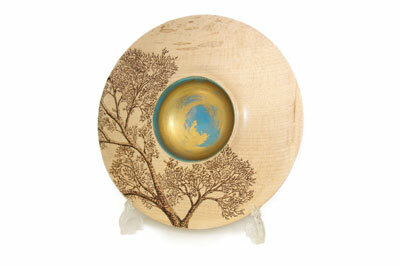 Mix with other woodturners whenever you get the chance and don't be afraid to ask questions. Remember, we all started at step one. 4. What music and which book are you currently into? I have a varied taste in music depending on my mood at the time - swing, classical, rock and roll, etc. The book I am re-reading at the moment is The Arcanum by Janet Gleeson - which looks at the history of European -porcelain. Most of the books in my collection are reference books. I use a lot of sycamore (Acer psuedoplatanus) for my work as its plain colour and tight grain works well for various decoration purposes, but I do like to work with yew (Taxus baccata) or walnut (Juglans regia) for the richness of colour and grain markings; wood like this stands well on its own without any form of decoration. I enjoy turning hollow forms, but I also like the challenges provided by cutting into a big oak (Quercus robur) or elm (Ulmus procera) burr. I occasionally find getting back to basics and turning a simple bowl form a pleasure. 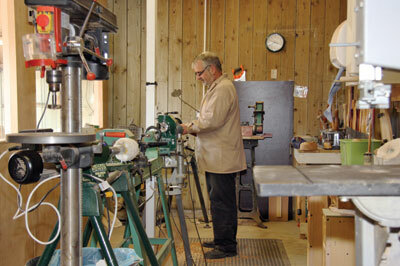 When I first started out I was taught the basics by Sue and Graham Harker; this experience got me hooked on turning. Another person who helped me was Joey Richardson. After seeing one of her demonstrations I suddenly realised that my only limitation was my imagination. This really opened my eyes to endless possibilities. There are lots more, too many to mention, but all have contributed in some way or another to the work I produce today. I find this question a bit difficult to answer as I have only been turning myself for just over three years but I would say the innovative developments of the cutting tools we use both in design and materials. 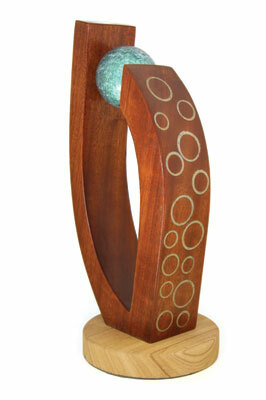 Even in my short time of woodturning, I have witnessed so many improvements. I have already achieved one of my main goals by being accepted on to the Register of Professional Turners (RPT). It would be great if I could expand further on the demonstration side of my work because I enjoy sharing my ideas with other woodturners. I also have lots of new ideas on my - to try - list and who knows what that will lead to. Possibly staunch traditionalists. If we are to encourage new blood into the woodturning community we need to make it exiting and interesting to a modern society which may include, dare I say it - painting wood. 11. What is your biggest regret? Without doubt it has to be not taking up turning much sooner instead of plumbing. I love to go sea fishing on the boat when the opportunity arises. Firstly, again this would be my extraction system; next would be my Nova DVR lathe, closely followed by my favourite swept-back grind 10mm (3/8in) bowl gouge.